VISON HI BUILD SYSTEM is a professional grade, easy spread, trowelable powder and VISON M4 latex liquid additive underlayment formula. Enhanced VISON HI BUILD is ideal for surface restoration, filling depressed or uneven substrates. Use VISON HI BUILD SYSTEM powder and VISON M4 latex liquid additive to fill or raise the old floor surface to flat and smooth surface prior to ceramic tile, natural stone, resilient flooring, carpet, wood and other floor coverings. VISON HI BUILD SYSTEM is applied in spot areas or in the entire room to an application thickness of 0” to 11/4" (0-38mm). Use VISON HI BUILD SYSTEM to re-smooth scarred, sloped, uneven or depressed substrates back to level. Upon screeding or spreading the underlayment patch, it will cure over-night to allow light traffic on the surface within 20-24 hours. 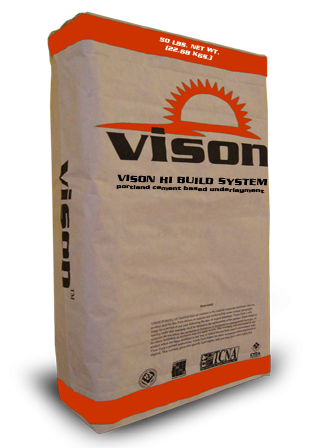 VISON HI BUILD SYSTEM is also ideal for interior/exterior use beneath carpet, vinyl, hardwood flooring, ceramic tile and natural stone installations. TEXTURE: Powder consisting of Portland cement, polymer additives, mineral filler, organic and inorganic chemicals. Free-flowing liquid consisting of latex/polymer emulsion. VISON HI BUILD is used for floor surface correction, surface filling of uneven, tilted or wavy substrates. VISON HI BUILD SYSTEM is an easy underlayment, easy spread, resurfacer and leveler of various substrates. Smooths surfaces for all types of floor finishes. Floor areas can be corrected and patched with minimal down time and fast cure properties. This product is not recommended for use over floor surfaces prone to flexing, vibration or movement. Do not apply over gypsum based surfaces, hardwood, particle board, parquet, strip wood floors, OSB board, lauan plywood, cushion or sponge-back vinyl flooring, metal, fiberglass, plastic or rubber. Not to be applied over painted, over-spray, old adhesives, curing compounds, waxes, oils, sealers or over unclean, loose or crumbling surfaces. Not recommended as a wear surface. Underlayment should be moisture tested to levels compatible to the hardwood, vinyl, rubber and carpet manufacturer's recommended levels before covering. For product installations, temperature of area to be leveled must remain above 50°F (10°C) for 72 hours. Concrete must be fully cured and must accept water penetration. Contaminants should be mechanically removed before installation. Use VISON M4 Latex Admixture liquid as a primer; applying to a porous/dry, rough or exterior surfaces will enhance bond. Allow primer coat to dry clear to touch prior to troweling product. If VISON M4 Latex Admixture liquid dries longer than 12 hours before underlayment placement it will necessary to re-prime surface. All substrates shall be rigid and non-flexing for live and dead loads. Floor structure and construction shall be conforming surfaces, interior application, properly gapped, glued and screwed. Brush or roll surface with VISON M4 Latex Admixture liquid as a primer for proper adhesion. After brushing primer to surface, allow primer coat to dry clear to touch before applying patch. Use corrosion resistant staples and attach ¼” (6mm) galvanized, expanded metal lath or corrosion resistant plastic lath to the plywood before applying VISON HI BUILD on applications greater than 1/4" full screed floor areas. For questions about proper subfloor installation, call VISON Tech’s Technical department. Install expansion joints around all perimeters or restraining surfaces where possible to allow for expansion movement. Expansion joints and cold joints, as described in ANSI A108.01, should never be bridged with setting material. They must be brought through the tile work and filled with an appropriate elastomeric sealant (100% Silicone). Contact Vison Tech’s Technical Services for the proper treatment of control or saw cut joints. Refer to TCNA Handbook EJ171. All surfaces will have to be brushed or dampened with clean water or latex admixture before VISON HI BUILD application. The VISON M4 Latex Admixture liquid must be brushed or rolled to the surface. On dry, porous and/or hot surfaces it may be necessary to apply additional coats to thoroughly saturate the bond surface. For best results, maintain all materials, substrates, room and adhesives at 50°-70°F (10-21°C) for 24 hours before and 72 hours after installation. In a clean container, add 50 lbs. (22.7 kg) VISON HI BUILD to approximately 1gal (3.7 l) of VISON M4 Latex Admixture liquid. Blend VISON HI BUILD powder and VISON M4 Latex Admixture liquid to a soft, trowelable, screedable, paste consistency. Do not over-water or mix the patch to a fluid or pourable mix. Excess latex liquid addition or overly fluid consistency causes aggregate segregation, cracking, peeling, uneven surface discoloration and will void product warranty. Mix material to a lump-free, uniform and non-flowable mix. Approximately 30 minutes, depending on ambient temperature. Ceramic tile and stone may be installed or set when the underlayment is firmly in place, typically 22 to 24 hours after installation is completed. Carpet, resilient flooring and wood floors products will be checked by moisture meter to be within levels state by those floor covering manufactures recommendations. Cold temperatures or high humidity may extend curing time.